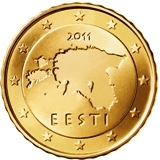 Estonia joined the Euro zone in 2011. 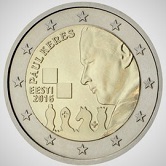 The Estonian Euro Coins have several intetresting features and the Commemoratives may prove of interest to chess players. Some basic facts relating to Estonia. 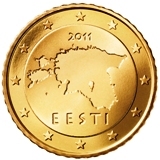 Unfortunately, there is only one motif for Estonian Euro Coins - an outline map of Estonia. Although unexciting it is somehow quite appealing. i) In the cent coins the map of Estonia is sunk relative to the background whereas in the 1 Euro and 2 Euro coins the map is raised relative to the background. 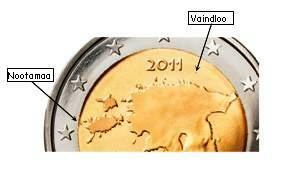 ii) On the 2 Euro coin two small islands, Vaindloo and Nootamaa, are depicted. 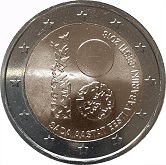 These, the most Northerly point and most Westerly point of Estonia are not depicted on the other coins. 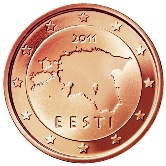 1 cent - Map of Estonia. 2 cent - Map of Estonia. 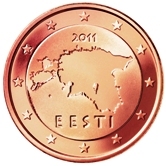 5 cent - Map of Estonia. 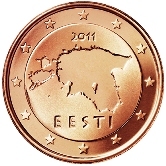 10 cent - Map of Estonia. 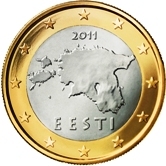 20 cent - Map of Estonia. 50 cent - Map of Estonia. 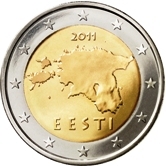 1 Euro - Map of Estonia. 2 Euro - Map of Estonia. 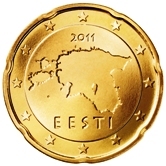 Around the rim of the Two Euro Coin the country name "EESTI" appears twice, separated by a circle. The two "EESTI"s are inverted down with respect to one another. 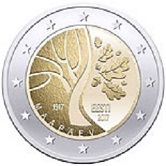 Estonian Commemorative Two Euro Coins. 2017 - 100th Anniversary of Estonian independeance. 2018 - 100 Years of Independence - joint issue with Latvia and Lithuania. 2018 - 100 Years of Independence. 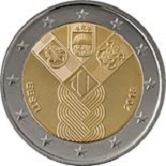 Return from Estonian Euro Coins to Links to Specific Countries. Return from Estonian Euro Coins to euro coin collector.